Is it snowing in La Clusaz ?Thank you! La Clusaz is a very French resort (part of the Les Aravis ski area) removed from the hustle and bustle of other resorts in the Alps. 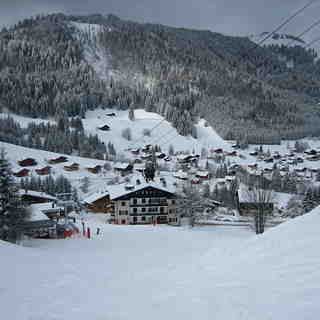 Five mountain slopes at La Clusaz offer 125 km of piste that descend from open glades into tree lined pistes. Beginners will revel in the variety, with 58% of the pistes at La Clusaz dedicated to them. 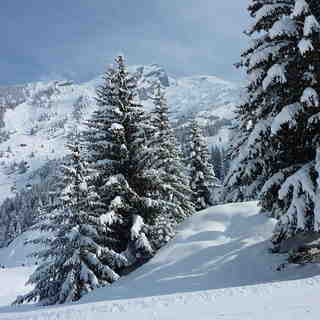 More advanced skiers would be recommended to explore the off-piste opportunities along the many Cols of the Aravis range. 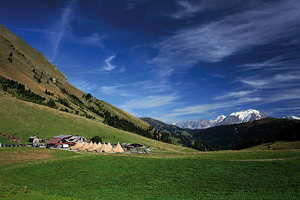 Off the slopes, La Clusaz offers rustic charm in an unspoiled French mountain town. A good selection of restaurants cater for the weekend skiers, from nearby Annecy, and prices reflect this. Many bars and two clubs provide the nightlife. This winter, the resort has developed several WiFi spots to enjoy easy access to the wireless and high-speed Internet, in the village but also by the slopes : from the icerink to the Bossonnet area, via the Church Square or the Aqua Centre. The departure and arrival areas of Balme gondola lift will also be covered. Les Pestacles du Père Noël is a 7 day celebration of the magic of Christmas. Magicians, puppeteers, story-tellers, jugglers, singers, musicians, artists and dancers all come together in the centre of the village for what has become a star attraction in La Clusaz. Young and old come year after year to revel in the timeless magic of the festive season. For more than 30 years, La Clusaz has been the mecca of freestyle and freeride ski. The resort thus decided to organize an exceptional event this winter: LCZ Radikal Mountain. During 7 days, it will be the epicenter of international freeride skiing with several competitions programmed both for juniors and the elite of the Freeride World Qualifiers. La Clusaz will host the best experts of digital technologies, innovation and e-commerce! Les Sommets du Digital, organized by Kawa Editions, is 30 speakers and 250 participants who will live a new experience about our connected world and about the best of what is done today and will be done tomorrow. A new concept mixing interactive conferences masterclass, one to one, activities and networking entertainments. The famous Full Moon Party is returning to La Clusaz again for the 13th time! Night becomes day for a memorable evenings’ skiing to the light of the silvery moon! Various slopes are open for the occasion where you can enjoy an exceptional and festive skiing experience under the stars and party in the numerous mountain restaurants and bars of the resort. The TOURNOI DES 6 STATIONS (The 6 Resorts) takes place during the week off of The 6 Nations. It is the first rugby sevens tournament to be played on groomed snow: 3 sixteen-minute matches organised everyday after the slopes close, around 6PM on the snowfront of each resort. La Clusaz will organise the final on Feb, 21st. In the wings of the tournament, the teams have challenges to take up on skis every afternoon: slaloms where poles are replaced with an oval ball that challengers must touch down once the finish line crossed. During the day, holiday-makers may experience introductions to snow-rugby and meet the professional rugbymen participating in the event. The SFR TOUR is a freestyle skiing competition in several stages. This year La Clusaz will be home of the finals again, so the best riders will do the show! Good MOO-SIC! Driven by the success of the first three events, the Radiomeuh.com team in association with the La Clusaz resort are returning with their Circus Festival to start the spring skiing period in music in the Alps. The playground has been extended since last year to include not only 3 nights of concerts under the circus tent, but stages and DJ sets are organised on the slopes throughout the week, continuing with après-ski and soirées in the village, for a total of 5 days. Radio Meuh’s notoriety has spread far past the borders of “Reblochonland” since its creation in 2007. Now with 5 million annual listeners, the radio can now claim to be a landmark among webradios. The radio plays an eclectic mix of different musical genres and is constantly on the look-out for new and creative musical talent. For the last 26 years the crazy “Défi Foly” sees sportsmen and women competing on skis, mono skis, snow boards, or anything that slides(!). Nothing different about that, you may think, but the event does not take place on snow. The aim is to slide the longest distance over the Confins Lake! Since 1986, 150 slightly crazy competitors compete each year in front of 1000s of spectators who come to watch this spectacular and exhilarating show. The star attraction of this day of fun and frolics has to be the OGNI event, otherwise known as Unidentified Floating Objects (UFOs! ), floating inventions right out of the imagination of those crazy enough to participate. These elaborate inventions provide a hilarious end to the event, as the spectators witness their sometimes catastrophic descent into the icy waters of the Confins Lake in the exceptional surroundings of the Confins, overlooked by the magnificent combes of the Aravis. 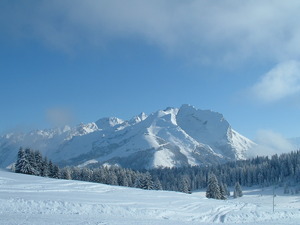 Actually under the name "La Clusaz" there are five interconnected ski centers with the same ticket: Balme, Aiguille, Etale, Beauregard and Manigod. Last year I visited Beauregard and Manigod. This year I skied Aiguille and Balme. So I am still missing Etale. I stayed in Annecy. 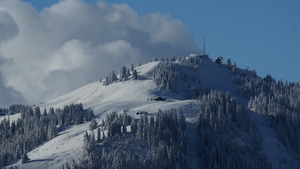 It is about 30km far away from La Clusaz and an hour bus drive. I took the offer from Annecy bus station. At 40€ per person a lift ticket and bus transfer are included. Really good price! The bus leaves from Annecy at 09:30 and returns at 17:00. I skied on Friday, 16th February 2018. What a fantastic ski day. I was really worried about rain that had fallen the last day. However, the rain caused no problem. Temperature was at about 6C in the base and around freezing level at the top of the mountains (approximately 2.500m). I rented good ski equipment at 27€/day. I started skiing in Auguille. The only piste in not so good condition was Merle, because there were too many people skiing on it. However, and despite the fact it was French winter school holidays and the ski center was really busy, there were almost no queues at the lifts. Snow coverage was really good: 40 cm at the base and more than 3 meters on the top. Not a single stone in the whole ski center. The weather was very changeable. In the lower slopes, there was little rain. In some slopes there was sun. On the top of the mountains (Aiguille and Balme as well) there was dense fog. On the top of Balme (piste Blanchot) it was snowing heavily. What a weather mixture in one single day and a single ski center! In my opinion, the best mountain is Balme. You do not need to take the gondola from Aiguille. I skied down the red piste La Fernuy. It was written that the piste was not prepared and the snow was heavy. Well, this was not true. Fernuy was pretty nice and the view from there was fantastic. Furthermore, Balme was much quiter than Aiguille and a lot more enjoyable, as the mountain was virtually empty from skiers. The red Blanchot, Torchere and Lachat were really good. Up on the top, in the beginning and the middle of Blanchot, it was snowing heavily. Down further, the weather cleared. I skied the red Lachat, which is a big red piste, totally alone! 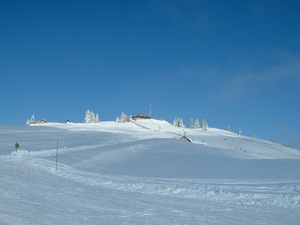 La Clusaz consists mostly of blue and red pistes. It is the paradise of the interemediate skier. You need at least three full days to visit all the five interconnected ski centers. Overall, it was one the best skiing experiences ever from all the aspects. La Clusaz is totally recommended!